If you have the good sense to invest in a bassinet for your baby, you will find out soon enough what a good decision you’ve made. Unlike a regular crib, a bassinet enables you to always be close to your baby, making it easier for you to attend to their needs in the middle of the night at a moment’s notice. For the most part, these exquisite cradles are light in weight, easy to set up, and extremely comfortable for the baby. Having said that, let us point out that not all bassinets are built to the same standards and that some of them are definitely better than others. In many ways, the good ones aren’t necessarily more expensive than the low-end models, even if the price tag would have you believe that. As such, you need to do a fair bit of research in order to figure out which bassinet would best suit your baby’s needs. Let us then take a look at the ten best baby bassinets the market has to offer at this point in time. 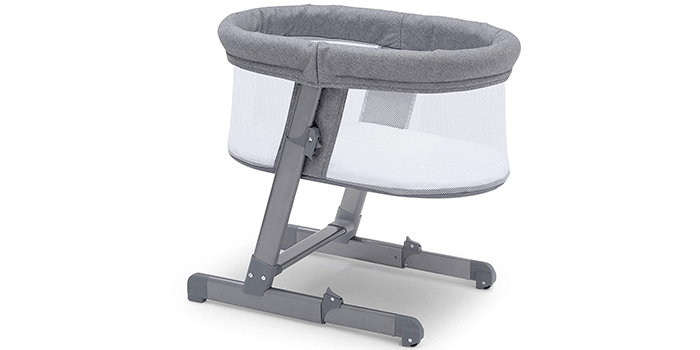 Designed with an adjustable frame with 5 different height positions to choose from, the Simmons Kids Oval City Sleeper Bassinet includes mesh sides that provide optimum air circulation and clear visibility of the baby. 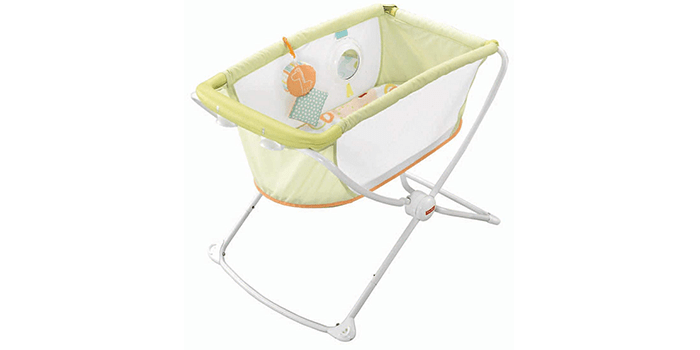 Suitable for babies up to 5 months old, this bassinet can hold up to 15 lbs. of weight approximately. Made from premium quality materials and featuring a sturdy frame, this baby cradle is JPMA certified and meets all the safety standards laid down by the CPSC & ASTM. 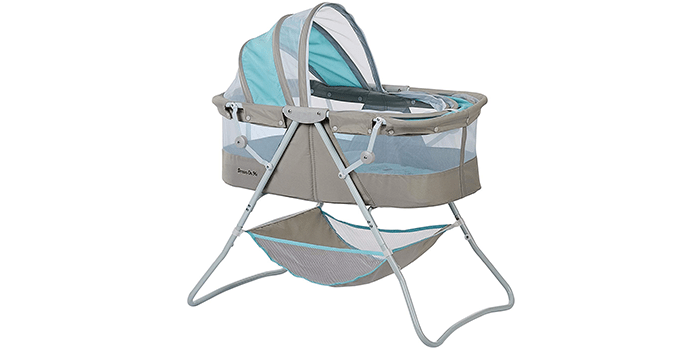 The Fisher-Price Rock ‘n Play Portable Bassinet is high-quality baby’s cradle that is designed with a flat, high-rise sleeping surface. Featuring a robust, sturdy frame, this bassinet can be rocked if gently pushed, calming and soothing the baby to sleep. Thanks to its unique construction, it can be easily folded flat and stored in any corner. Extremely durable, portable and lightweight, this bassinet also comes with a small mirror and a soft toy that can be hooked on or removed when needed. Uniquely designed and equipped with soothing sounds and melodies, the Summer Infant Soothe & Sleep Bassinet vibrates and helps calm your baby to sleep. Thanks to its heavy duty wheels, it allows easy and effortless mobility around the house. Featuring a high-quality mattress that is well padded, it comes with a fitted sheet made from soft cotton material. Unlike others of its kind, it also comes designed with a storage basket at the bottom of the bassinet that can hold all the necessary baby items. Made from premium quality dark walnut wood, it features a durable canopy that can be adjusted to your requirements. The Green Frog Baby Bassinet is a lightweight portable cradle designed with custom wheels for easy maneuverability. Featuring a premium construction and design, this bassinet comes with round mesh windows on the side that allow full visibility plus enable optimum breathability and ventilation. Low in height, it includes a soft premium comfort mattress that is perfect for providing the right about of stability for a newborn. It also comes equipped with a high-quality cotton sheet that can be removed from the frame and washed with ease. Easy to install or detach, this bassinet includes snap-on legs and rockers and also comes with a carry bag that makes it easily transportable. 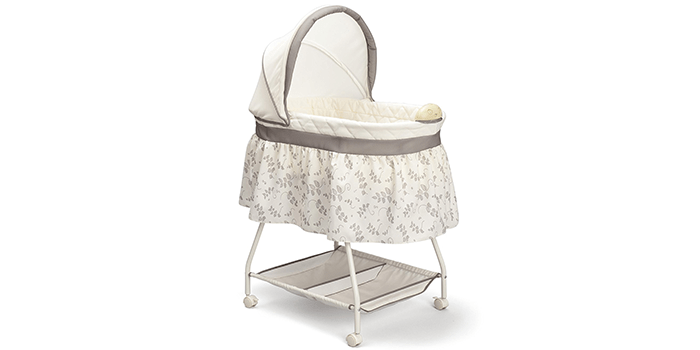 The Graco Dream Suite Bassinet is an all-in-one product that can be used as a reversible cradle as well as a changer. With the ability to hold up to 30 lbs. 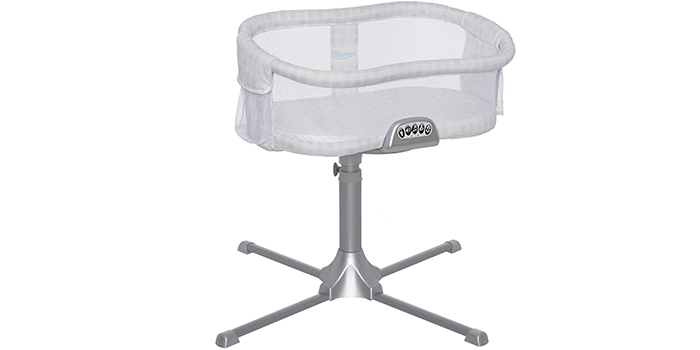 of weight, this bassinet can be used for diaper changes without any hassle. Equipped with a special vibration mode with 2 levels of speed, it helps to soothe and calm the baby. Thanks to its 4 heavy-duty locking wheels, it can be easily moved around the house and parked in any given spot. The high-quality canopy helps in offering shade from harsh light while the two play toys keep the baby focused when cranky. Built with a strong frame with a high-quality polyester fitted sheet, the Halo Bassinest Swivel Sleeper Premiere Series Bassinet features a versatile 360-degree rotational design that ensures you do not disturb your baby while they sleep. Ideal for mothers who are nursing or those who have undergone a C-section, this bassinet features side walls that can be lowered for easy tending to the baby and can be locked for optimum safety. Thanks to its versatile design, it easily tucks into beds that are 22 inches to 34 inches tall and only requires a clearance of up to 32 inches from the wall. Featuring a subtle night light, 3 sounds, 2 vibration levels, 3 lullabies, and a nursing timer, these features include an automatic shut off timer of 30 minutes. Crafted for babies weighing up to 15 lbs. or less, the Delta Children Sweet Beginnings Bassinet is a premium quality cradle that comes with a great set of features. Including an adjustable, detachable canopy, it also features soothing music and a night light that helps to calm babies. 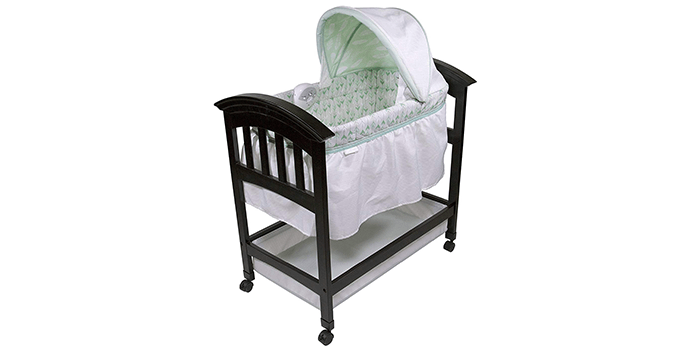 Measuring 33 inches long, 17 inches wide and 45 inches high, this bassinet comes designed with a sturdy steel frame and a high-quality polyester fiber padding with a fitted sheet. Light in weight, convenient to use and extremely durable, it comes equipped with custom wheels with a locking mechanism that allows quick and easy maneuverability from one room to another. The two baskets at the bottom of the bassinet allow easy storage of the baby’s important items. Made from premium quality polyester foam fabric, the Dream On Me Karley Bassinet is a sturdy, heavy-duty baby cradle that comes designed with a double canopy and a sleeping pad. Crafted to hold infants up to 25 lbs. 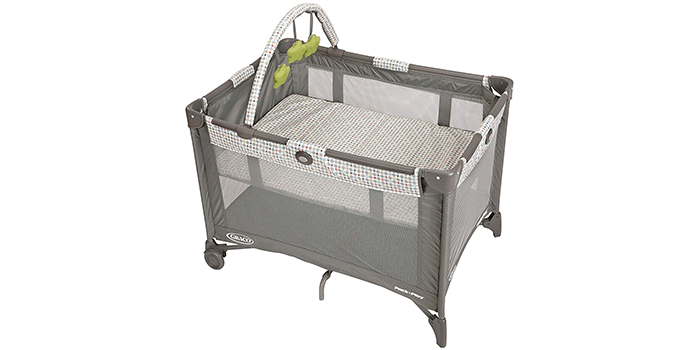 in weight, this bassinet measures 33.5 x 18.3 x 47 inches in size, which makes it one of the most accommodating out there. Including a soft, well-cushioned 1″ mattress, it offers optimum levels of comfort and support for your baby. Light in weight, durable, and highly portable, this bassinet features a special construction that makes it easy to fold and even easier to store. Made from 100% premium grade, imported polyester, the SwaddleMe By Your Side Sleeper features a heavy-duty metal frame which can be folded for easy storage and transportability. 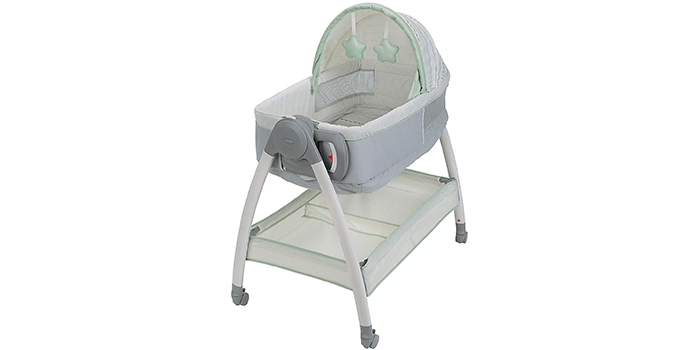 Known for its performance and quality, this bassinet comes with mesh sides that not only offer optimum visibility of your baby but also provide proper air circulation and protects the baby from heat. Including a soft, padded mattress and a fitted sheet made with comfortable fabric, this bassinet is ideal for home use and during traveling. Measuring 32 inches in length, 14.5 inches in width and 11 inches in height, this bassinet is suitable for newborn infants until they reach an age where they can roll over. 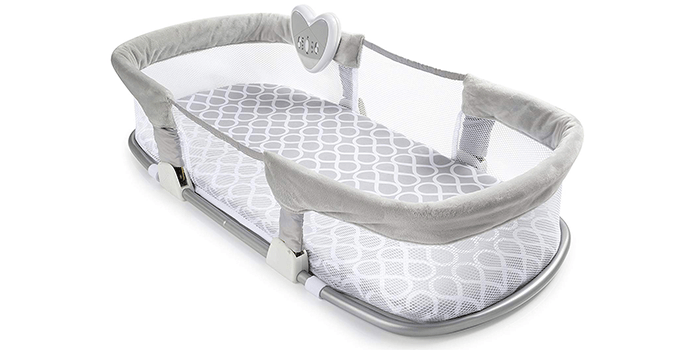 Seen by many as the perfect cradle for babies to catch a quick nap or sleep soundly throughout the night, the Graco Pack ‘n Play On the Go Playard is an adjustable, detachable bassinet that offers comfort and support for your infant. Featuring a special playpen station that can be removed with relative ease, it comes with an additional changing pad for extra comfort while changing diapers. Thanks to its high-quality wipe-clean fabric, the changing table can be easily cleaned with a wet cloth. 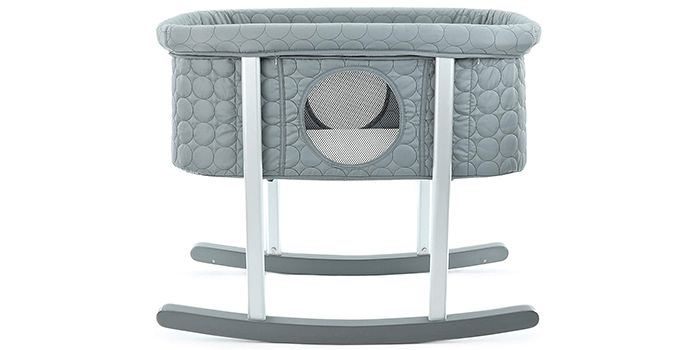 With ventilated mesh on all 4 walls of the bassinet, it features custom wheels that are robust make the bassinet very mobile.